3/11/15 Well the FT-857D has been in the shack for a month now and it seems to work flawlessly here so I'm fairly confident that my problem was DC voltage. Now that the weather has warmed significantly perhaps I can open the hood of the car and mull over where to go next with a re installation. I do miss it. The reinstalled radio is shown at right. It fits into the console fairly nicely. Is convenient and doesn't interfere with either the looks or function of the console. The Little Tarheel antenna rocker switch is just out of the picture to the left of the heater/AC controls, stuck to the console with double sided tape. The speaker, an MFJ speaker sits on the dash, also mounted with double sided tape. I could interface it with the car sound system but I think I like it better with its own dedicated speaker. It's great to have a setup that will work all frequencies from 160 through 440. 3/17/15 Yesterday it was a really nice day so I parked the car in the sun, opened the hood and began exploring for an easy way to get power from the battery to the underside of the front passenger seat where I want to install the Yaesu. There it was! A large rubber "plug" in a larger hole in the passenger side of the firewall. It has a molded cable through the center but lots of space around that. So I carefully (well not too carefully) cut a slit in it and fished the #10 power cable through it. I had already removed the glove box cover thanks to a YouTube video that showed how so it was really easy to fish the wires out from under the dash. And their don't appear to be any sharp edges to threaten them. With that done I encased the wires in a plastic corrugated sheath (one of those that is split lengthwise) and tie wrapped it all up against the firewall away from the engine and any moving parts. Then I attached a 30 Amp fuse holder in each wire and attached them to the battery. I removed the fuses for now since the wires are not connected to anything inside yet. I decided yesterday to install a power block on the inside of the cabin side of the firewall to make it easy to change radios and power multiple devices as needed. I have a Little Tarheel Screwdriver antenna so need power for it in addition to the radio. Last night I ordered a pre-made block using Anderson Power poles jacks. It should be here on Monday. Next came re-installing the antenna. I wanted to put it back on the license plate mount but without the spring. I also noticed that things were pretty badly corroded so spent some time cleaning it all up. Salt from the roads is a real mess up here in Wisconsin. I haven't checked it with RF so am not positive all is well but I think it is. The biggest problem was that the control cable which uses a small Molex connector was corroded. It took some cleaning with alcohol to finally get that to take power. I fear it may be erratic. Another problem is that the coax connector on the bottom of the antenna has a smooth edge rather than having teeth or even four notches. The PL259 plug has two teeth on it. The result is a not too good connection for RF. I think that further explains why after a few months of using it last year it developed an intermittent antenna connection. I think I'll write the Tarheel people and ask about that as it just looks like a matter of time until the intermittent is back. I may rerun the feed-line and antenna control line tomorrow for the antenna and put the radio back under the seat so I'm all ready to go when the Power pole panel arrives. 3/21/15 Since this is the first day of Spring I decided I better work on the installation at least a little. 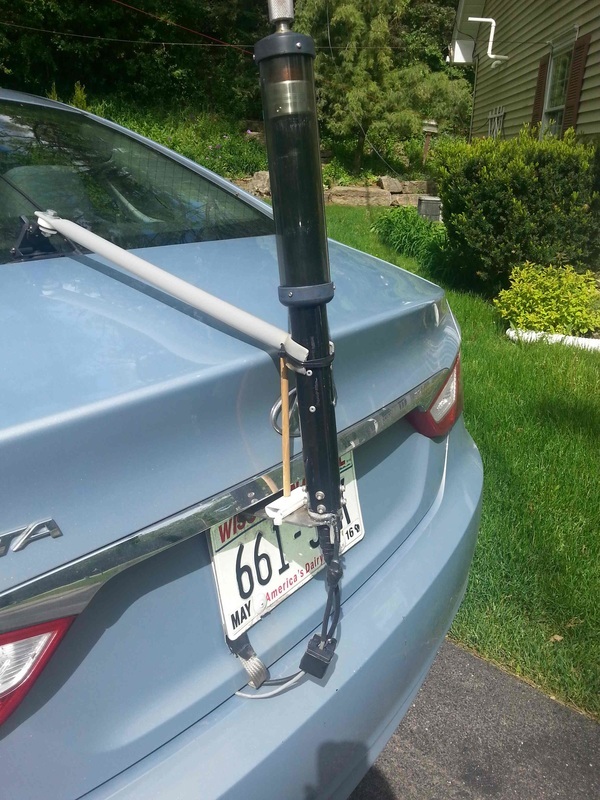 So I installed my VHF/UHF mag mount antenna so the feedline can come up from the trunk instead of through a side door. So made a little overall progress today. Anderson Power Pole block in small pocket on the passenger side of the console. 4/7/15 I completed the installation. Found a neat place for the Anderson Power Pole Power power block on the passenger side of the center console in my Hyundai Sonata. It has this little "pocket" molded into the plastic that is only a couple of inches deep and as you can see not very practically shaped so you really can't put much in it. But it was wide and deep enough for me to make a plastic plate into which I mounted the Anderson Power Pole jacks. It provides easy access to the firewall where the wire comes through. So I'm pleased. I installed four jacks. But the best news is that there is ABSOLUTELY NO ELECTRICAL OR ENGINE NOISE on the radio! It is as quite with the engine running as when it is off. And the voltage is stable at 14.3 volts whether listening or transmitting at 100 watts. I suppose that is in part thanks to the number ten wire that goes directly to the battery. As I said above I connected the Power Pole panel directly to the battery plus and minus. As I thumbed through the May 2015 issue of QST recently I came across K0BG's article on "The Modern Mobile on page 35. In it he points out that later model cars have a current or load sensor built into the ground lead from the battery which feeds to the car's computer so it can manage the charging and other things properly. So he says you should ﻿not ﻿connect your rig's negative line directly to the battery lug but to the body end of the ground lead from the battery so the rig's current goes through the sensor so in turn the car can manage the load current accurately. So I made that change. I recall when I initially connected it up I was a bit puzzled by the rather elaborate ground cable connector on the battery and wondered what the extra "signal" wires were all about. Now I know! Can't say I notice anything different either about the car or the rig as a result but I feel better knowing my car knows all it needs to know to keep me going down the road. I've had several dozen QSOs on 40, 20, 17 and 24 meters, a couple DX to Europe. I've run a full 100 watts with no noticeable affect on the car. The antenna is easy to tune. I initially marked 80, 40 and 20 mtrs on the Little Tarheel screwdriver with blue painters tape so I just run it to those and then tweak it by listening for peak noise or signal and then give it a final tweak on transmit for lowest SWR. It registers very near to 1:1 on all frequencies. Needless to say I am very pleased with this re-install. 5/8/15 I've really enjoyed having the mobile back in the car. Nearly every time I drive I turn it on and if the bands are friendly at all try and usually have a QSO. The mainstay is the Midcars Net on 7.258mhz. Someone is almost always there so it is pretty rare to NOT get a QSO. Another I check out almost every time is the YL System Net on 14.332mhz. I'm impressed how they have two net control stations on almost all the time so no matter where you are in the country you can likely be heard. Beyond that I just check around and either call or respond to a CQ. The Little Tarheel screwdriver antenna really works well. This is not a commercial for them but I have absolutely no complaints. I have learned that installation details are important. Driving down to south Chicago the other day with a friend in the rain I wanted to show off ham radio. But the antenna wouldn't tune. It went up and down but the SWR was terrible and didn't change much on any band. So when I got home I decided to trouble shoot it. I checked the cables from the radio to the antenna and all was well. I used a dummy load to do that. I then took my trusty little MFJ-204B Antenna Bridge and connected it directly to the antenna base. Just as the radio thought it didn't tune, had no obvious resonant frequency and never changed regardless of where the coil was adjusted. I decided to completely remove it thinking something had gone wrong inside and I'd probably need to send it to the factory. But within moments I realized the problem. The insulating washer that fits between the base of the antenna and the mounting bracket was all cruded up and acted like a conductor rather than an insulator! So I cleaned it up real good, put some silicone sealer around it and remounted the antenna. Works perfect! Moral to the story, especially in this winter/salt country, check your antenna often and do whatever you can to protect these vital spots on the installation.